As Sanctions Take A Toll, Debate In Iran Heats Up Talks on Iran's nuclear activities appear to be at a halt, but there is action behind the scenes. Iran's public position hasn't changed. But privately, debate is growing over whether the nuclear program is worth the economic pain of harsh banking and oil sanctions that continue to do their work. 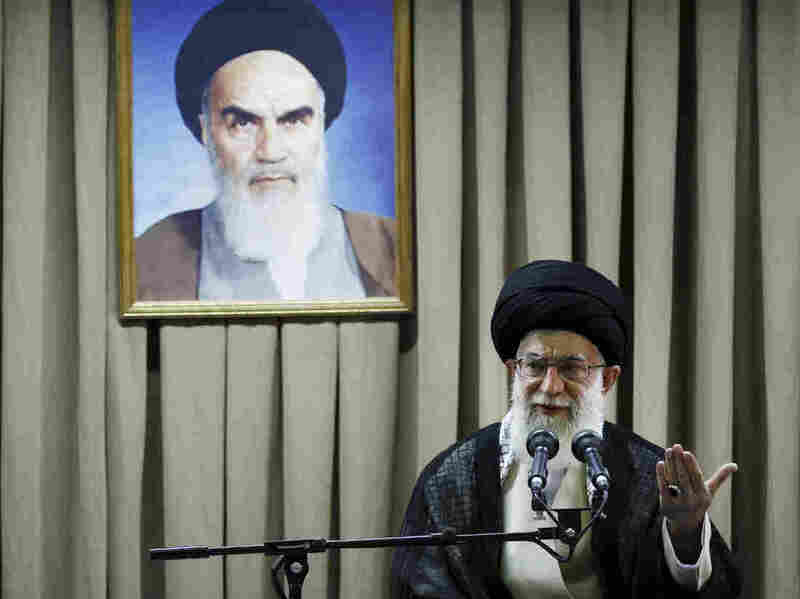 Iranian Supreme Leader Ayatollah Ali Khamenei delivers a speech in Tehran in July. Khamenei says Western-led sanctions will not force Iran to change its policies, but there are signs of other concerned voices in Iran. Last week, Amano, the director general of the International Atomic Energy Agency, told a meeting of the agency in Vienna that he is aggravated by Iran's unwillingness to show the IAEA what's going on at a base called Parchin. "Iran should engage with us without further delay on the substance of our concerns," he said. "We need to stop going around in circles, discussing process." The International Atomic Energy Agency suspects the Parchin military complex southeast of Tehran was used for secret work on atomic weapons. 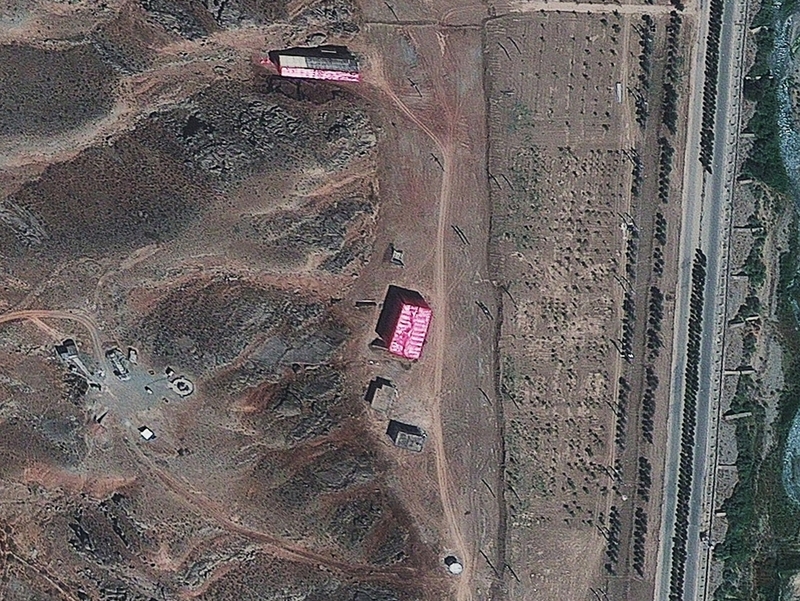 Amano really wants to see what's under some plastic sheeting at Parchin, where for months Iranian workers have been busy taking down buildings, tearing up roads and planting new shrubs. The suspicion is that Iran engaged in high explosive tests there — the kind that might be related to a nuclear weapon. As a result of the IAEA's frustration, and the so-far unfruitful talks with the U.S., Europe, China and Russia, there is a move to further tighten the already painful economic sanctions imposed on Iran. That was the message from British Foreign Secretary William Hague just a few days ago. "It is necessary to increase the pressure on Iran, to intensify sanctions, and to add further to the EU sanctions that are already in force which are having a serious impact on Iran," Hague said. Both France and Germany have echoed that sentiment. In a recent TV appearance, President Mahmoud Ahmadinejad acknowledged that Iran is hurting under the pressure. He said there are barriers to selling their oil, and there are barriers hindering the transfer of their money. But they are lifting those barriers, he said, adding it takes months to remove them. Can Sanctions Force Iran To Change Its Policies? In fact, right now Iran is exporting less than half the oil it was selling a year ago. The value of Iran's currency, the rial, continues to plummet. Last week, the rial hit 25,000 to the dollar. A year ago, it was 9,000 to the dollar. This has triggered widespread inflation and even food shortages in some places. The sanctions are doing what they are designed to do, says Karim Sadjadpour, an Iran expert at the Carnegie Endowment for International Peace. "At the moment I think the Obama administration believes that cold gridlock is better than hot conflict," Sadjadpour says. "So simply containing the situation until November is something positive." These appear to be the two prongs of the administration's strategy: Engage with Iran to the extent possible through talks led by the European Union, and let the oil and banking sanctions do their work until at least after the November presidential election. If Iran is feeling the economic pain, though, the ultimate aim of the pressure is still elusive, Sadjadpour says. "The goal of the sanctions is to compel the Iranian leadership to change the nuclear calculations, and so far there's no evidence that it has done that," he says. One man holds the key — the Supreme Leader, Ayatollah Ali Khamenei. His attitude has always been to never compromise because, in his view, concessions signal weakness and invite even more pressure, says Golnaz Esfandiari, an Iran analyst at Radio Free Europe/Radio Liberty. "You know Khamenei doesn't listen to others. He makes ... he's been the ultimate decision-maker for more than two decades, and he hasn't been listening to other people," she says. But there are indications the pressure is sparking debate within Iran. Some conservatives in the press and the parliament, as well as senior officials, are questioning whether the nuclear program is worth the pain. "There is concern. Even though you hear Iranian officials saying that, you know, we've been under sanctions for 30 years, or more than 30 years, and this is nothing new for us. But you hear voices of people who are concerned," Esfandiari says. Still, it is not yet clear what level of economic pain, if any, will cause Iran to rethink its nuclear activities.